I've been exercising and eating right for many years -- yet it never occured to me that I wasn't getting all the nutrients I needed for good health. The same was true with my horses -- they SEEMED healthy, but they certainly weren't giving me 100%. In addition, it seemed like the horses I knew and insure weren't at optimum health, even though they looked good. Insidious things like gastro-intestinal issues, soft tissue injuries, auto-immune issues, joint problems were occuring regularly, to horses that receive the best from owners who truly care. So I had to ask, "WHY?" The Broken Paradigm© or, What your vet, trainer and other “nutrition” professionals will not tell you. Patching the patch is no longer working, not that there’s any consensus from legitimate nutritional experts that it ever actually did. For those who haven’t been around that long and for those who have all but have forgotten, here’s how we got our horses into this mess in the first place. Back a generation or so ago 5 acres per horse was the standard rule of thumb for grazing. As taxes and land got more expensive, that accepted minimum standard was decreased from 5 acres down to 2, then 1 and today for many horses, such as in a typical “training barn”, there is little or none. Patch #1. Hay Supplement. As both the quantity and the quality of available grazing steadily declined we patched that problem by shifting to a dependence on cut and baled hay -- hay often right from our own field as a patch or supplement for the necessary nutrition eliminated by reduced grazing. Results: Hay Supplement helps but doesn’t provide adequate diversity or density of nutrition. While this patch improved the problems initially, the nutritional value of any agricultural product is limited by the type, quality and volume of fertilizers used in its production. During this same time frame the shift from organic fertilizers to petroleum based chemicals devastated the available nutrition from all agriculture, including hay products. The standard petro based fertilizers for hay type crops are NPK: Phosphorus, Potassium, and Nitrogen. To replace the thousands of naturally occurring nutrients found in healthy organic soil you get 3 petroleum based chemical ones. Do a quick search/ research on these 3 chemicals and their effect on crops. Why should you care? To equal the nutrition of one organic apple grown at the turn of the century, it would take 30 to 32 conventional apples produced today. Knowledge empowers you. Patch #2. “Animal quality” grains. As the limitations of hay became obvious, a new and different source of nutrition was needed. Enter “Animal quality” grains. These whole grain products lacked the consistency in size or color to be used in human food, but they were, in fact, still whole grain foods. Results: Loaded with diversity and density of nutrition these marvelous grains, used in small quantities, did a respectable job in patching the mounting problems from Functional Malnutrition© beginning to plague the equine industry. New problem. The profit driven corporate bio-ag and food processing cartels needed a way to eliminate the cost of disposal of millions of tons of waste materials from grain mills and food processing. Using their enormous political power they proceeded to have the old definition of “animal quality” “re-defined” to include any waste products they had a need to dispose of. This new “arrangement” replaced the expense of waste disposal with a new corporate profit center that sells these waste materials to “feed” companies. In many cases this waste material becomes the number one ingredient by weight for feed products. You might recognize these waste material as processed grain by-products, plant and roughage by-products (and undisclosed GMO) being sold as “complete” nutritional products for your horse(s). Patch #3. As the definition and nutritional quality of “concentrated feeds” rapidly declines, and the horse's health and performance begins to decline right along with it, the self-proclaimed nutrition experts selling these new “complete feed” products had a great solution -- “buy more, feed more”! Results: Huge increases in the cost of feeding, digestion and colic issues increase. A new even more profitable industry is created. Patch #4. Nutritional Supplements. A whole new industry is birthed to create catalogues of patches of every kind, size and description, including smart packaging, in an attempt to solve the new litany of Functional Malnutrition© problems and the epidemic of disease in the modern horse. Results: The supplement industry makes lots of money. The problems keep getting worse. Horses suffer and die from diseases at epidemic levels, increasing costs (#1 Vet bills) drive horse owners out of the industry in record numbers and the industry remains silent to protect the status (profits) quo. Patch #5 Vet and Pharmaceutical Intervention. Yes those magnanimous folks from the Pharmopoly have a growing list of expensive drugs that block or mask symptoms, all with serious to fatal side effects. Many Vets are right on board with this, some say because they get paid substantial fees to administer these highly profitable “treatments” on a regular basis. Well it beats annual worming and shots. Don’t believe it? You’re not alone. Much of the industry has become so jaded from the non-stop advertising, big name sponsorships and tons of free products to the big barns that have completely lost track of the basic facts and laws of nature. The newest and many say the most dangerous trend is vets recommending feeds and selling supplements and other products they don’t adequately research beyond their “Business Model” value. Type “soy dangers” into your search engine and find out what feed and supplement sellers don’t want you to know about how they make your horse fat and shiny at the expense of good health and performance. The companies profiting from The Broken Paradigm© want you to believe generally preventable chronic diseases are just part of owning a horse. Issues like colic, ulcers, founder and the litany of metabolic issues; Cushing’s Symptoms, Insulin Resistance and many others all of which are all directly related to Functional Malnutrition©, the universal disease caused by The Broken Paradigm©. Well they are right if you follow the The Broken Paradigm© of conventional hay, concentrated feed products, supplements and intervention. 80 to 90% will have pre-colic, colic problems requiring vet treatment/bills. Up to 20% of will die. Pharma says all performance horses have pre-ulcer or ulcer issues. Expensive treatments required. #1 ulcer “prevention” has FDA warning of fatal heart incidents, plus esophageal cancer warning. Metabolic Issues are so rampant some breeds are in jeopardy. Estimates range up to 75% or worse. #1 cause of death in horses; colic Treatment cost $300 to $10,000. Recurrence probable. #2 cause of death, cancer. #1 long term side effect of preservatives in feed & supplements, cancer. #1 reason for a 70% plus turn around of horses/ owners in the industry; Vet bills for above. Horses are herbivores. In nature they walk and eat when and where they need to find the nutrition they require. While grazing, a horse in nature will cover up to 200 acres in a day, selecting from as many as 300 different organic food choices. Understand that the basic nutritional requirements of the horse have not changed and cannot be changed. Studies show sport, performance horses and breeding stock’s nutritional requirements have increased. Yet horses have gradually over time, strictly for the convenience of man, have had most if not all of their natural sources of required nutrition eliminated. They have been replaced by cheap, low quality fill ingredients “fortified” with high profit manufactured isolated synthetic nutrients in fancy bags called feeds and supplements. There is a completely different paradigm available. A clear and definitive choice. A natural organic herbal food based product line from BlueRidge Distribution Inc. 20 years in extensive research and development have been spent. Not to provide another patch for this paradigm of patches over patches, but to provide you and your horses a unique individualized nutritional program that eliminates Functional Malnutrition©. No more high priced “feeds”, patchwork supplements, chronic problems with the accompanying vet bills. HP Daily™. 3 products, 1 price. I scoop daily. 1. Organic Whole Food Herbal Nutrition. AKA: Organic Herbivore Food. The most comprehensive herbal based, organic nutritional program ever developed. Over 20,000, 100% bio-available nutrients, micro-nutrients, phyto-nutrients not found in any commercially available product. 2. The #1 digestion, absorption, and utilization, product in the industry. The unequalled immune function multiplier, colic prevention and ulcer prevention program. 3. The five most tested, recommended and proven joint maintenance ingredients available. 1 bag a month, 1 scoop a day convenience. Introductory pricing $49.99 monthly, plus shipping, delivered to your door monthly. Volume pricing available. BRD Inc. A better world starts with better choices. Processed foods, animal feed products and most supplements derive their primary nutritional value from individual nutrients added to various base materials or fillers. A more correct term for these individual nutrients is “synthetic isolates.” These synthetic isolate ingredients are listed on product labels as well as under the “Guaranteed analysis” portion of the labeling. Synthetic Isolates are individual vitamins, minerals or any other “nutrients” isolated or extracted from natural sources like plants or are otherwise manufactured by various chemical processes. These synthetic isolates are almost universally utilized for four simple reasons: 1. They are in abundant supply. 2. They are easy to handle and process. 3. They are very inexpensive. 4. They create huge profits for product manufacturers. What does the science say about synthetic isolates? Research from independent studies is clear regarding the efficacy of these synthetic isolates. Multiple studies have confirmed synthetic isolates are a form of nutrition (nutrients) that are not efficiently digested or absorbed and are often not recognized by living biology (i.e., humans or horses) as nutrition. These products are not efficiently utilized by the body and are not a viable substitute for whole food nutrition. Long term use of these types of feeds and supplements will result in Functional Malnutrition causing poor health and appearance, chronic digestion problems, allergies, soft tissue injuries, inconsistent performance, and the inability to heal properly. Manufactured nutritional supplements (synthetic isolates) simply can’t compete with better live whole food choices that provide nutrition synergistically.While these synthetic isolates may offer some impressive reading on product labels, “Guaranteed analysis” labels, and advertising campaigns, their real world benefits are minimal. Studies have consistently concluded the absorption and utilization levels by the body can range from minimal to minuscule. In the case of the minerals and nutrients critical to all biological functions, absorption rates average about 3%, but can be as low as zero. Studies have also shown synthetic isolates can be “seen” by the body as foreign invaders engaging autoimmune responses to destroy them. These auto-immune responses can escalate into serious allergic reactions and although rare, can be potentially fatal. In stark contrast, the nutrients in whole food are naturally recognized, easily digested and efficiently absorbed by the body. Whole food nutrients are 100% bio-available. Nature’s complete array of 100% bio-available (completely absorbable) vitamins, minerals, enzymes, proteins, essential fatty acids, friendly bacteria, phytonutrients, micro-nutrients and more can only be found in organic whole foods. Whole foods contain highly complex structures that combine a variety of enzymes, coenzymes, antioxidants, trace elements, activators and many other unknown or undiscovered factors all working together synergistically, to enable complex nutrition to do its job in the body. Nutrients from within this whole food complex cannot be taken apart or isolated from the whole and be expected to do the same job in the body as the whole complex is proven capable of doing for millennia of natural history. 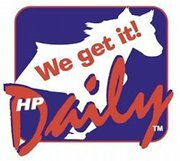 The organic whole food nutrition from HP Daily provides complete daily nutritional in a convenient 1 scoop a day protocol that every horse owner can afford.